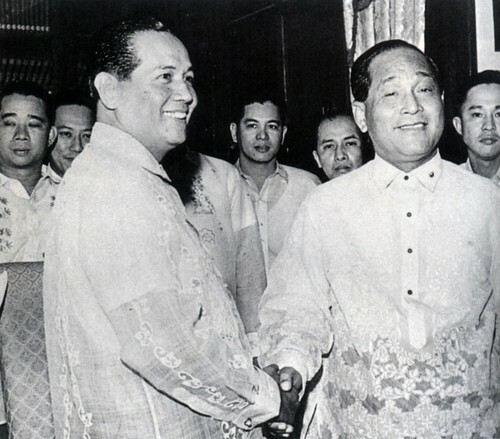 (above) December 30, 1961: in their last few minutes as incumbent President and outgoing Vice-President, respectively, Carlos P. Garcia and Diosdado Macapagal put on an appearance of bonhomie as they prepare to depart for the Quirino Grandstand for Macapagal’s inaugural; within 24 hours Macapagal had voided Garcia’s 350 midnight appointments. Benigno Aquino III has thrown down the gauntlet in light of the President’s toying with appointing the next Chief Justice when the current Chief Justice retires on May 17 (ideally, by that time, the public would already know who the next President is, and the date falls about a month and a half before the official term of the incumbent expires, when there is a blanket prohibition on appointments from the time the last two months of a president’s term starts). The Palace is suitably miffed. The Palace insists the President shouldn’t leave the position of Chief Justice vacant (the Chief Justice himself prefers his successor be named sooner rather than later, but not for reasons complimentary to the President: there is the chance the election might end up a shambles and the Supreme Court will have to weigh in), and, in the face of the Judicial and Bar Council’s refusing to convene to draw up a shortlist, the Senate President and the Speaker of the House have both put forward the theory (shared by PhilConsa) that the President needn’t wait for a JBC shortlist. A compromise has been proposed: an Acting or Interim Chief Justice. The Court has never had an acting chief justice? Look up Claudio Teehankee, the great dissenter who first served, for almost a month, as acting chief before being named the first chief justice after Edsa. The office of chief justice has never been vacant? The very first succession, when Victorino Mapa replaced Arellano in April 1920, was marked by a vacancy that lasted a couple of weeks. Postwar, there were more such vacancies. Cesar Bengzon did not succeed Ricardo Paras until more than two months had passed, and almost five months passed before Makalintal formally replaced Concepcion. Still, lawyers and the public are dividing on the question of whether the President is entitled to name the next Chief Justice. Besides being an interesting legal question, it’s one fraught with the past efforts of presidents to saddle their successors with appointments made at the last minute. By all accounts the transition from Presidents Osmena to Roxas was smooth; but the one from Presidents Quirino to Magsaysay wasn’t so smooth. In his last days as President, Elpidio Quirino granted presidential pardons to friends and allies, an act of political patronage condemned by his successor, President Ramon Magsaysay. While the issue was carried to the Philippines’ Supreme Court, the bank remained without a governor, and its monetary board was unable to make decisions. Exporters, anticipating the devaluation of the peso from the official rate of two to the dollar to a more realistic four to the dollar, halted shipments abroad, and kept their dollars in the U.S. until they could bring them home more profitably. The resulting trade deficit has been devastating, and foreign exchange reserves dropped to an alltime low of $100 million. The court quarrel over the bank governorship gave Macapagal time to huddle with his advisers. Using an exhaustive World Bank report and other studies, they mapped out a five-year economic program to decontrol the country’s long-stifled economy. First step: to decontrol the peso itself. Recognizing that he could not risk freeing the peso without enough dollars in hand to meet any run on the banks, Macapagal last month sent a six-man mission under Finance Minister Fernando Sison to the U.S.
Last week the Philippine Supreme Court ruled 9 to 1 that Macapagal could oust Garcia’s man from the bank governorship and install his own. Simultaneously, members of Sison’s mission returned to Manila with good news: in their search for U.S. dollars they had not met a single refusal. In hand: $166 million in private bank loans; $121 million from the International Monetary Fund and various U.S. agencies. In all, Macapagal can begin his reform administration with a sizable backlog of about $400 million. He plans to ease import-export controls, continue some tariffs in a way that will encourage agriculture, discourage luxury imports. The use of the appointing and other powers by an incumbent, either for partisan electioneering purposes, or to tie the hands of the expected successor, is something our Constitution and laws have tried to curtail, with the Quirino and Garcia precedents in mind. Even in 1962, with the controversial Garcia appointments in mind, the Supreme Court “found it logical” that past precedent had presidents submitting ad interim appointments only when Congress’ Commission on Appointments was in session. Our present Constitution and the various laws governing the administration of the bureaucracy strictly forbids the President of the Philippines from making appointments once the Election Period begins. When a nation embarks on electing its leadership, our Constitution, laws, judicial and historical precedents all emphasize that incumbents must be barred from abusing their powers to give themselves or their partisans undue advantage, thwart the public will, or harass and harm a successor’s administration by tying its hands by means of maliciously-motivated appointments. It is common sense to believe that after the proclamation of the election of President Macapagal, his was no more than ‘care-taker’ administration. He was duty bound to prepare for the orderly transfer of authority the incoming President, and he should not do acts which he ought to know, would embarrass or obstruct the policies of his successor. This brings us to Atty. Manuel Laserna Jr. (see his Midnight appointments to the judiciary) who has called attention to the Supreme Court’s decision, A.M. No. 98-5-01-SC November 9, 1998, pointing to another aspect of the dangers of midnight appointments made during the transition from one administration to another: judicial midnight appointments. These were already mentioned in 1962 in Castillo v. Aytona as follows. Being ambassador in Spain and desiring to return to this Court even as associate justice, Moran was tendered an ad interim appointment thereto by President Quirino, after the latter had lost the election to President Magsaysay, and before leaving the Presidency. Said Ambassador declined to qualify being of the opinion that the matter should be left to the incoming newly-elected President. In his online commentary published January 11, 2010, Atty. Laserna discusses the implications of which is important because it acts as a bridge between the 1962 case decided under a previous constitution, and the 1998 case which was decided under the present Constitution, showing continuity of broad constitutional themes. 12. To be sure, instances may be conceived of the imperative need for an appointment, during the period of the ban, not only in the executive but also in the Supreme Court. This may be the case should the membership of the court be so reduced that it will have no quorum or should the voting on a particularly important question requiring expeditious resolution be evenly divided. Such a case, however, is covered by neither Section 15 of Article VII nor Section 4 (1) and 9 of Article VIII. 14. While the filling of vacancies in the judiciary is undoubtedly in the public interest, there is no showing in this case of any compelling reason to justify the making of the appointments during the period of the ban. On the other hand, as already discussed, there is a strong public policy for the prohibition against appointments made within the period of the ban. The issues then are joined as follows. The law prohibits appointments by the President on the Philippines on the assumption that in an election year, these appointments may be made maliciously to pervert democracy or embarrass the constitutional succession from one administration to its duly-elected successor. On the other hand, there are Constitutionally-mandated requirements for the President to make appointments to the Supreme Court within a specific period. Which should prevail? The administration argues immediately filling a vacancy in the Supreme Court, specifically that of the Chief Justice when a Chief Justice retires, transcends the legal prohibitions on presidential appointments within a fixed period from the end of the President’s term and during the Election Period. The Supreme Court itself has said that possibly compelling reasons to flout the ban if they exist, are rare and raise the bar of executive justification very high. In the 1998 case, the JBC had the excuse of not having any clear interpretation of the Constitutional provisions on the period for filling up vacancies in the judiciary, and on the ban against appointments related to the Presidential election. As narrated by the 1998 Resolution, then Senior Associate Justice Florenz D. Regalado, Consultant of the JBC, who had been a member of the Committee of the Executive Department and of the Committee on the Judicial Department of the 1986 Constitutional Commission, expressed the view that the election ban had no application to appointments to the Court of Appeals. Regalado’s opinion was accepted by the members of the JBC (with the exception of then Chief Justice Andres Narvasa) “without any extended discussion or any prior research and study”. Such excuse is no longer available for the JBC now. The November 9, 1998 En Banc Resolution of the Supreme Court should be the governing interpretation of the Constitutional provisions involved. Interestingly, two members of the current JBC had been part of the discussions of the 1998 case -Chief Justice Puno, who was then an Associate Justice of the Supreme Court, and retired Justice Regino Hermosisima, who was already a member of the JBC. In Defensor’s letter to the JBC, the relevant provisions of the Constitution (Section 4 of Article VIII, and Section 15 of Article VII) were conspicuously omitted. Thus, the proposition to avoid a vacancy of even a single day was made without any consideration of the ninety day period given by the Constitution for the appointment, and the ban imposed by the Constitution against making such appointment on May 17, 2010 or on any date within the period of the ban. Can the JBC pretend to be grappling for an interpretation of the Constitutional provisions? Such pretension cannot be justified. For one, as pointed out earlier, there is no conflict between the provisions on the ban and on the period for the appointment. There is no controversy, no issue that will prompt the JBC to make its own interpretation. The JBC’s role is to follow the Constitution. Follow the ban imposed by Section 15 of Article VII, and follow the ninety day period for the appointment, as prescribed by Section 4(1) of Article VIII. More importantly, with the 1998 Resolution, any issue as to the interpretation of the applicable Constitutional provisions should be deemed settled. The JBC is bound to follow such ruling. While a Supreme Court ruling is good until a reversal by a more recent ruling – and there have been a number of cases where the Court had reversed its earlier decision, with some reversals being done in the same case, and a few notable examples of complete turnarounds upon a second Motion for Reconsideration – the JBC cannot go against a standing interpretation by the Court. The comparison of the two presidents points to one clear conclusion. If the ban under Section 15, Article VII was deemed applicable to Ramos’ appointment of two trial court judges, it should apply with greater force to Arroyo’s appointment of the next Chief Justice. The evil sought to be avoided by the ban is manifested in a more dangerous form in the present case. What is clear then is that since the Quirino adminstration, most notably the Garcia case opposed administratively and in the courts by Macapagal, and in the case of Ramos, outgoing incumbents have tried to hamper their successors or exercise their powers even when improperly theirs to exercise during a transition period, by means of midnight appointments. Jurisprudence and our political experience and our present Constitution have put our institutions firmly in opposition to this executive temptation. The question is whether a President who contravenes the spirit and letter of our laws and tries to relive the bad practices of her predecessor can make a Supreme Court appointment that has any legal validity. The example of former Chief Justice Manuel Moran is the most instructive. Even if attempted, and even if beneficial to an appointee to the Supreme Court, delicadeza requires the appointee to decline the appointment. Old-fashioned notions of self-control and informal limits to official conduct are generally meaningless today, but might still mean something in the most tradition-minded of our three branches of government, the judiciary. This problem ensues because we haven’t institutionalized yet the ‘Transition’ phase in-between Presidencies. As we saw during the Bush-Obama transition, both teams put so much effort in the transition process. If only we have such an institutionalized process here, we can avoid so many problems related to midnight appointments. …but this is still legal, right? any justice appointed by GMA as chief justice and accepted will surely declare the appointment legal, :). Noynoy Aquino could have used the AIM forum to air his grievances about midnight appointments. But his dismal showing in past debates has caused him to shy away from public forums, afraid to be exposed as all air and hype. Noynoy is now taking the same strategy that Erap and FPJ did during their Presidential forays. Less talk, less foot in the mouth. So much for substance! Aquino’s concern is valid but he should think the consequences of his proposals or threat before he opens his mouth. What he had said may lead to a constitutional crisis if he indeed became a president and PGMA appointed a new chief justice. Beyond the question of the propriety or impropriety of appointing these officials, perhaps the broader question in all this is whether or not to prosecute a former president as soon as s/he steps down. After all, there are fundamentally no ideological differences between incumbent and contenders which would normally motivate protection of judicial appointments, since the third branch can be called on to legislate from the bench. Take the cases of Chile and Korea where the prosecution of dictators took place only after some significant time had elapsed. There was less disruption as a result. The case of Erap illustrates the perils of a direct successor taking him to court. So should GMA be allowed some temporary reprieve for now? If history is to be the judge, we will forget and forgive over time. Erap was the exception, not the rule. And he got off relatively easy. He was treated with kid gloves, allowed house arrest, where he entertained a constant flow of guests and finally set free, enjoying most of his wealth. Unrepentant and defiant, he is now trying to vindicate himself by winning a second presidential election. More significantly, Marcos and his family got away with almost everything. The Marcos family remains extremely wealthy, powerful and unbowed. Their biggest beef is with the Marcos cronies, such as the Antonio Cojuangcos, Danding Cojuangcos, Lucio Tan and others, who kept the Marcos share of the loot to themselves. Carl Cid Inting, you bring up a reasonable and even broader point than mine, and that is the maturity of the state and of the rule of law. In the countries I mentioned, Chile and Korea, they had advanced significantly both economically and politically, and their states were sufficiently stable and secure so as to prosecute their cases against past rulers impartially without fear or favour. In our case, we have yet to reach that level of maturity so that any attempt at bringing about justice will be fraught with difficulties. Any semblance of the rule of law simply illusory or tentative at best. By the way, I fully agree with your views on campaign rhetoric. By the way, just to illustrate how difficult it is to institute far-reaching reforms, even in advanced and mature countries, we can take as an example the present circumstances of the Democratic party in the United States. After an impressive landslide victory at the polls barely a year ago, Barack Obama is now facing voters’ backlash. And Obama is still a few days away from completing a year in office! Ted Kennedy’s Senate seat in Massachusetts is in danger of being taken by Republicans this Tuesday, a day before the 1st anniversary of Obama’s inauguration. This will not only leave Democrats 1 vote shy of the filibuster-proof 60 votes needed at the U.S. Senate, it will give Republicans more numbers in the Senate that could enable them to create mischief. Even the Senate majority leader, Harry Reid, is in danger of losing his seat in mid-term elections this coming November. Obama and the Democratic Party are becoming more unpopular by the day. Apparently, Americans don’t want to swallow the bitter pill of reform. It’s that simple, if you find the regimen prescribed by the doctor unpleasant, change doctors. Obama’s change is in danger of fizzling out much sooner than expected. Of course, Americans are immature and prone to instant gratification. And Filipinos are probably more so. And if the redneck masses in the U.S. can easily be manipulated by the Rush Limbaughs and Glenn Becks, the Filipino masses are even more malleable. That’s why it’s very difficult for real change to occur anytime soon. Let’s be optimists for a while and think and ponder why a candidate who vows not to steal while president might be a good potential for change as a start. After all, not every candidate can promise something like that, can they? MANOLO, why won’t your manok Noynoy attend policy debates? I agree there will be a constitutional crisis if PGMA appoints a new chief justice before the election then Noynoy if he wins do not recognizes the new chief justice. Therefore, to avoid a constitutional crisis, PGMA should not do it. If Noynoy is sincere and honest with his threat then there seems to be nothing wrong with saying it now, is there? I wish to make a correction to my earlier statement. Chile never got to successfully convict Pinochet. In fact a quote from the attorney general was that “Our country has the degree of justice that the political transition permits us to have.” Pinochet was under house arrest awaiting trial when he died. This in fact proves my point though. Chile’s GDP was estimated at US$14,000 in 2006 the time of Pinochet’s death. If a country that rich still had struggles implementing the rule of law, what more in a country which has a GDP of a mere US$3,300? Talk is cheap, more so during the heat of an electoral campaign. EVERY candidate promises something like vowing not to steal. Even convicted felons like Erap swear over stacks of bibles that they never stole, much less will ever steal. That’s the oldest line in the world. That’s a motherhood statement that no one ever takes seriously. Aquino again declines to participate in policy debates. This one is to be held in Cebu. This only confirms what many have been saying: Noynoy only relies on the laurels of his parents and his family. On his own, he doesn’t have the qualities for leadership. He is just piggybacking on his name. Maybe Nick is right, why don’t we have all the presidentiables vow/swear on the bible/mothers’/fathers/ graves (mother in laws not included) that if elected they will not steal (directly and indirectly) from the country and that they will not recover their billions invested in this campaign later on…lets have it in writing and on television under threat of beheading if he proven guilty of violating it. I wonder who would have the balls to do that?! Dr J will eventually get tired of maintaining too many accounts, hey on top of being delusional (genius kuno) you’re got multiple personality too? the question of course is can every candidate conceivably accomodate every debate, when no prior planning has been undertaken and when candidates have to do other things besides attend every debate put forward willy-nilly by every group? candidates first of all are consulted and a rational schedule put forward allowing the campaigns to balance appearances in debates with their need to go on the stump and appear in other fora before local audiences. before local audiences the interrogation can be much more critical and sustained than in the fora (they’re really round table discussions, not debates) so it’s not as if any of these candidates are dodging anything by preferring a local audience: having appeared in the zobel forum which was no holds barred, it made sense to meet commitments in la union which has a large voting population. there are other ways to communicate and address policy concerns, such as the forthcoming policy address to business groups: now as for views on the effectiveness or failure of individual candidates during debates, that’s for the public to decide and of course supporters of one will view every appearance as succesful and never concede that for rivals. but its the uncommitted or the undecided who will ultimately decide. the real question is why can’t the various groups get their acts together and focus on clearly-scheduled debates that offer less wiggle room to any candidate to avoid; or better yet why not arrainge real debates round robin style, where the leading contenders face off one on one. now that might be a truly productive, because real, debate. What do you think about Noynoy now vis-a-vis the Manila Standard column below? Are we seeing the real Senator Noynoy Aquino in the way he is reacting to questions on his qualifications and record to become President of the Philippines? His advisers should tell Aquino that he sounded haughty, arrogant and pompous the way he handled the legitimate observation by another presidential candidate, Senator Richard Gordon, who said that it seemed Aquino had not done anything for his home province of Tarlac despite having served as congressman for three terms. But Aquino should realize that itâ€™s not only Gordon who wants to know what he did for Tarlac in his nine years as congressman, where he even served as Deputy Speaker for Luzon. The public that he wants to lead as president deserves to know what his record was. He cannot even use the excuse that he was a fiscalizer of the Arroyo administration all the time that he was in the House of Representatives since, as has been pointed out, he served as deputy speaker and he was supportive of the Arroyo administration just as the Arroyo Administration was supportive of him. Of course we can understand his pique at Gordonâ€™s remarks if he has nothing much to show for his nine-year stint at the House of Representative and his almost three years in the Senate for the province of Tarlac and for Central Luzon. It would be interesting to see a comparison of what he did with his Countrywide Development Fund and what ex-Defense Secretary Gilbert â€œGiboâ€ Teodoro, who represented the other district of Tarlac, did with his own fund. If Aquino did nothing for his district when he was congressman and now as senator, then there are questions on what he promises to do if he becomes President. Gordon, of course, has all the right to make his observations on Aquinoâ€™s qualifications. Gordon has an exemplary record of achievements as mayor of Olongapo City, as Administrator of Subic Bay Metropolitan Authority, as chairman of the Philippine National Red Cross and as senator. It would have been interesting to know what Aquinoâ€™s experience and track record are. He gave a glimpse of his experience when he responded to the questions on his competence raised by Gordon and another presidentiable, Sen. Manny Villar. According to news reports Aquino, pointed to his experience as a member of a marketing team that made Nike a household name in the country in the mid-80â€™s. He said he also helped implement changes in the sugarcane production of his familyâ€™s Hacienda Luisita. This is laudable considering that he has repeatedly said that he only has a four-percent share in the controversial large tract of agricultural land subjected to a stock-distribution-option type of land reform, where shares of stocks instead of land were distributed to farmers. Aquino said he was also proud in his role as fiscalizer as a congressman and as a senator. Perhaps he or his defenders should explain how he was a fiscalizer during the time when he was deputy speaker. If Aquino was a fiscalizer of the Arroyo administration then perhaps what Vice Governor Rolex Suplico told us during a radio interviewâ€”that Aquino even supported President Arroyo in the first impeachment case against herâ€”is not true. We would like to think that what Aquino had mentioned as his experience and track record is only partial and we should be expecting an expanded list of his achievements. Only then can we be assured that the country would be in good hands in case he becomes president. Its not arrogance, its called MORAL HIGH GROUND. Something Gordon/Gibo/Villar don’t have, the charlatans. The true legacy of the Arroyo years may lie in the fabricated uncertainties that litter the road to MalacaÃ±ang. The entire debate over the appointment of the next chief justice, for instance, is only the latest manufactured crisis: What will happen to the Supreme Court if Punoâ€™s successor is not immediately named? As the Courtâ€™s own history proves, the real answer is clear: nothing that can rise to the level of a crisis. Quite recently, a close adviser to the President described her as having turned â€œiconoclastic.â€ This initially puzzled me, but now I think I am beginning to understand. She has turned to breaking idols, to attacking cherished beliefsâ€”including those that make democracy possible in the first place. Far too many REAL INTERNATIONAL EXPERTS (the Oxford-Cambridge and Ivy League types) have time and time again said repeatedly that the Parliamentary System (the real one with the Prime Minister having the real executive power) is less prone to corruption than a “Separation-of-Powers” Presidential System is.